There is a morbid fascination with lives lost or thrown away, the puzzlement of people sinking into hoarding, the zoning out, the giving up and giving in to squalor. Who would have thought that you could make a musical based on such a premise, let alone a pretty compelling one? Apparently, Doug Wright (author of I Am My Own Wife), Scott Frankel (music) and Michael Korie (lyrics) did. And we’re glad they did, as the musical born of that attempt — Grey Gardens, now at the Ahmanson Theatre — proves again that musical theatre can rise to surprising heights tackling just about any subject, no matter how dark or unlikely. Think of Stephen Sondheim’s Sweeney Todd and think especially of the Tom Kitt/Brian Yorkey Next to Normal, which so movingly chronicles the devastation of one woman’s bipolar disorder to the confusion and bewilderment of her family. Grey Gardens is largely based on the Maysles Brothers 1975 documentary about Edith Bouvier Beale and her daughter, “Little Edie” Beale, relatives of Jackie Bouvier Kennedy Onassis and once members of the same East Coast aristocracy. Thanks to a kind of reckless irrationality, the women over time sank into poverty and grime at the once grand 28-room mansion they shared in The Hamptons. The documentary made a large impression, not least because of the family name, but also because it was unsparing in its tell-all detail, showing us how these two not untalented women also shared a profound disconnection with reality and a stifling co-dependent relationship with each other. These elements drove their descent into a hell of bad hygiene and eerie obliviousness, spent in weird get-ups, and shared chiefly with stray cats, raccoons, mountains of garbage, armies of fleas and other vermin. 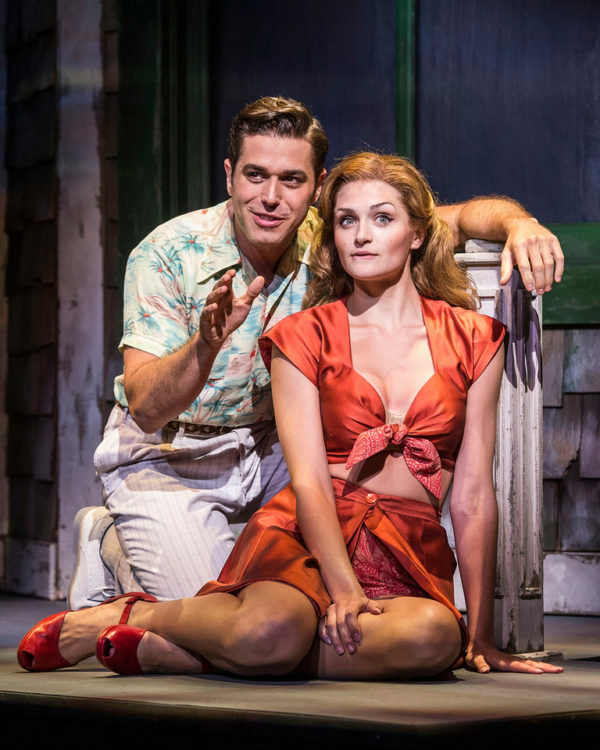 Josh Young and Sarah Hunt in Grey Gardens The Musical atThe Ahmanson Theatre. 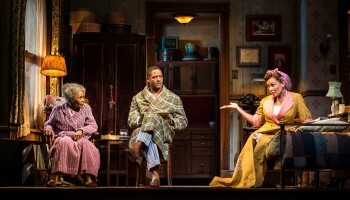 l-r, Betty Buckley, Josh Young and Rachel York in Grey Gardens The Musical. The two stars (they earn that distinction) are the focus of this second half. Buckley’s role as the elderly Edith is a lot smaller than York’s, but she still gets to show her mettle, particularly in “The Cake I Had” and the melancholy duet with York, “Another Winter In a Summer Town.” But it is York who walks away with the laurels, largely because of her attentive portrayal as she uncannily slips into the mannerisms, deportment, vocal patterns, costumes (recreated by Ilona Somogyi) eccentricities and even facial ruddiness of the real-life Little Edie. In that sense, this is a voyeuristic musical without much other reason for being than the witnessing of the humanity of it all. Frankel’s music and Korie’s lyrics are smart and in places deeply touching. Even though Buckley’s role is relatively small, she gives it size. Not much here that is hummable, but York’s masterful performance and the spectacle of the hapless disintegration of these interconnected lives, especially given the station these women were born to in life, is unavoidably mesmerizing. Michael Wilson (The Trip to Bountiful) has staged this touring production, with a welcome light touch, rich in meticulous detail. The decision to use oversized projections of the action on the exterior of the mansion (projections designed by Jason H. Thompson, in a nod to the documentary) is, however, a dubious choice. They may work well seen from the mezzanine or the rear of the orchestra, but closer up they are mostly distracting. 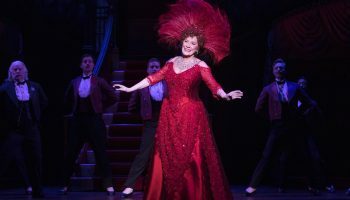 Starting with Somogyi’s uncompromising array of costumes the rest of the production values serve the piece well, from the discreet lighting by Howell Binkley, to Jon Weston’s sound design. Attractive Sarah Hunt’s turn as Little Edie in the first half is just manic enough to hint at trouble to come. As her beau, Joe Kennedy Jr., Josh Young is saddled with a bland role, but he makes up for it in the second half in a tenderly complex portrait as Jerry, the delivery boy who has formed a filial attachment to the elderly Edith. We get interesting glimpses of Jackie and Lee Bouvier (Katie Silverman and Peyton Ella, respectively) as pre-pubescent girls visiting their aunt, while Bryan Batt provides the portrait of the standard-issue live-in parasite, George Gould Strong, and Simon Jones alternately portrays the disapproving J.V. “Major” Bouvier and, in a brief cameo, Norman Vincent Peale. In the end, it is that second act that stays with us — and York’s indelible achievement. 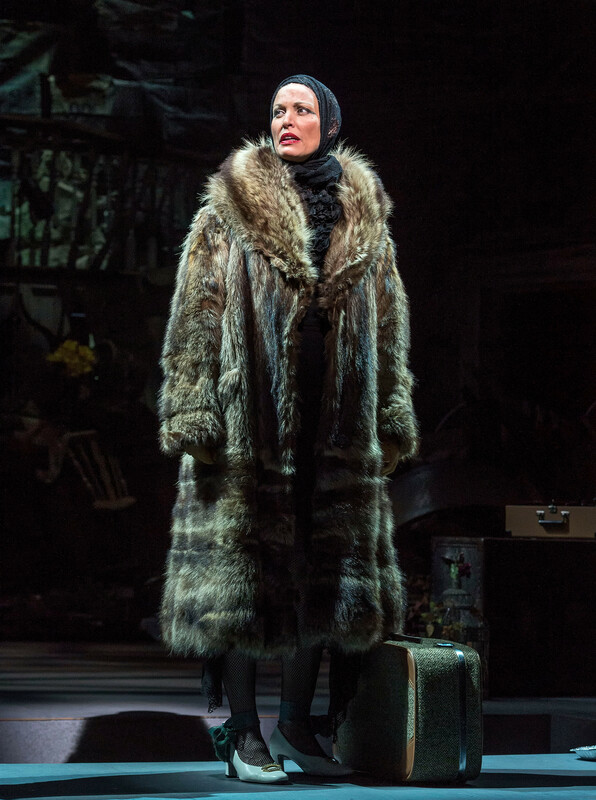 Rachel York in Grey Gardens The Musical. 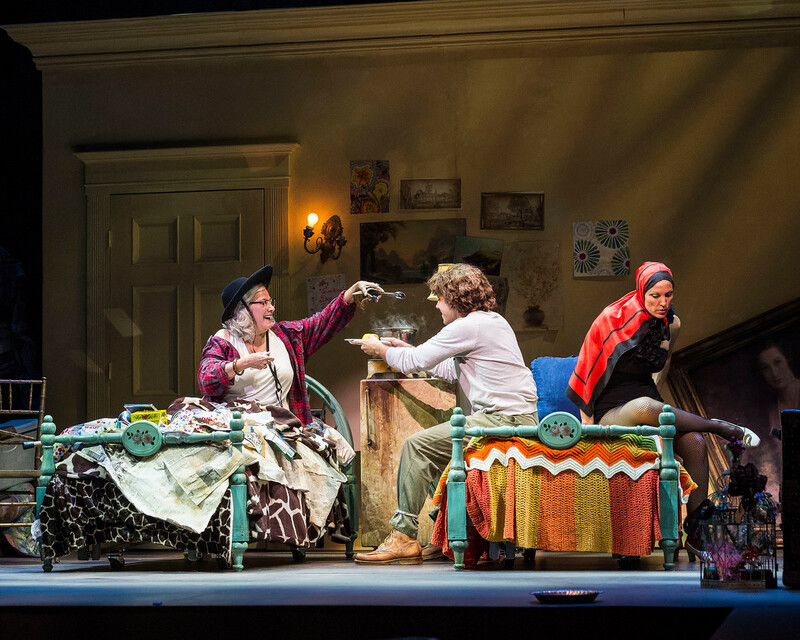 Top image: l-r, Rachel York and Betty Buckley in Grey Gardens The Musical at the Ahmanson Theatre. All Photos by Craig Schwartz. WHERE: Ahmanson Theatre, 135 N. Grand Avenue, Los Angeles, CA 90012. WHEN: Tuesdays-Fridays, 8pm; Saturdays, 2 & 8pm; Sundays, 1 & 6:30pm. Ends August 14. Exceptions: 2 pm matinee Thursday, August 11. No 6:30pm performance on August 14. HOW: Tickets: $25-$130 (subject to change), available at (213) 972-4400 or www.CenterTheatreGroup.org or in person at the Ahmanson theatre box office. Hot Tix: $25, available in advance by phone or, subject to availability, at the box office on the day of performance (no checks). Deaf community: visit CenterTheatreGroup.org/ProjectDATE. Groups: (213) 972-7231. Across town, a strange little play that is more provocatively titled than provocative, opened last weekend at the Odyssey Theatres. It is the West Coast premiere of David Greenspan’s Go Back To Where You Are. A group of theatre artists are getting together at the Long Island beach house of stage diva Claire (Shannon Holt) to celebrate the birthday of Claire’s talented daughter Carolyn — a character much talked about but never seen. Attending this party are Claire’s friend Charlotte, a less successful actor (Annabelle Gurwitch) who deeply wishes she were Claire; Claire’s self-deprecating bother Bernard (Justin Huen), an aspiring playwright who mostly teaches playwriting; a gay couple consisting of abrasive director Tom (Bill Brochtrup) and his partner Malcolm, a set designer (Jeffrey Hutchinson) — and Claire’s son Wally (Andrew Walke) who’s still mourning the loss of his partner to AIDS. Two other characters govern the action of the play: Passalus (John Fleck), an interloper who shows up in this rather tense little group and may be an actor, a demon, a menial ancient Greek who gets his orders from God (Hutchinson’s voice) and who, now and then, assumes the persona of a mysterious Mrs. Simmons. Passalus falls in love with… Well, we can’t give it all away. 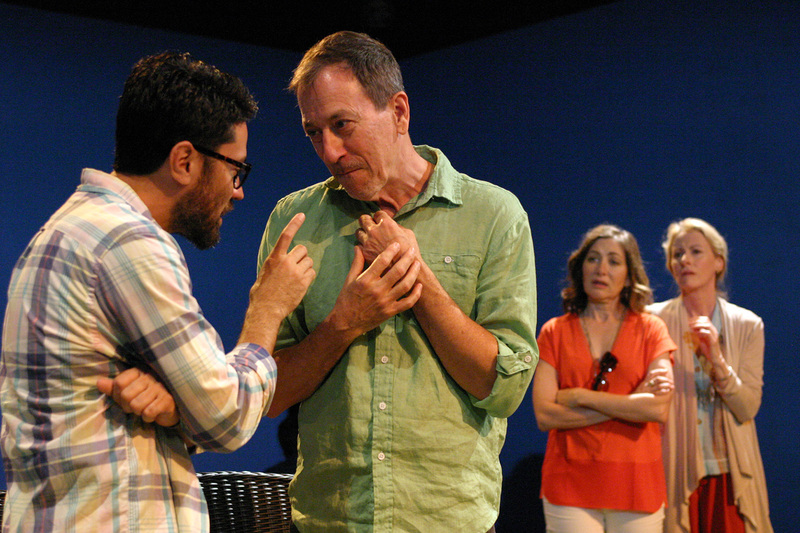 l-r, Justin Huen, John Fleck, Annabelle Gurwitch and Shannon Holt in Go Back To Where You Are at the Odyssey Theatre. Photo by Enci Box. I tell you this much because it is my conviction that everyone in the theatre — including metatheatre (look that up) — is well intentioned. So, technically, this production is a well-intentioned attempt at comedy with a satirical streak. But either Greenspan’s ambition exceeded his grasp with this one — or this production, staged by Bart DeLorenzo, doesn’t quite manage to locate the funny. Or both. Greenspan’s eccentric writing (new to me and better known in New York than here) is an overly stylized experiment, with stage directions, random thoughts and asides popping up in the dialogue where they don’t belong and when you least expect them. Presumably they’re aiming for laughs, but mostly they create confusion. When Claire, speaking of Bernard, says “These plays he writes, they start here, they go there. You practically need a map to follow them,” it’s an inside joke that speaks the truth. Pirandello would love Go Back To Where you Are; even its title is Pirandellesque. So might Eugene O’Neill, who’d spot vague parallels with his Strange Interlude. But this play also has enough non-sequiturs in uncommon places that it feels as if we’re lost in the middle of Alain Robbe-Grillet’s Last Year at Marienbad (assuming that movie even has a middle). At Saturday’s opening the disjointed text primarily succeeded in creating a distance and coolness among the actors that scuttled whatever scrap of satire there might have been. What should have been funny was just effortful. One of the production’s neatest aspects is Nina Caussa’s austere beach setting, with sand, and grasses growing on either side of a plain rectangular platform on which sit a bench and a couple of beach chairs. A little more of this kind of simplicity might have helped. And then again, maybe not. WHERE: Odyssey Theatres, 2055 S. Sepulveda Blvd. WHEN: Now-Sept. 4. Call theatre for schedule at (310) 477-2055. HOW: Tickets $25-$34, available at OdysseyTheatre.com or (310) 477-2055 ext. 2.